Once again this holiday season at Walt Disney World from November 6, 2018, through January 6, 2019, guests can enjoy Santa's elves Lanny and Wayne rescue Santa from the villainous Oogie Boogie, from the film The Nightmare Before Christmas, during Disney Hollywood Studios' nighttime spectacular fireworks event Jingle Bell, Jingle BAM! The name of the show is taken from a joyful exclamation used by Santa's elves in the Prep & Landing animated cartoons produced by Disney. Also this year is the return of the special ticketed Holiday Dessert Party in the courtyard of the Chinese Theater, where guests can enjoy multiple food stations featuring holiday-inspired treats. Guests receive a pair of 3D HoloSpec glasses that turn the bright lights into holographic illusions, like gingerbread men and candy canes. I love the animated shorts in the Prep & Landing filmography and I also love how detailed the background story was created on the world of the North Pole and its inhabitants. For seven years I have been eagerly awaiting another installment, but those prospects get dimmed with each passing holiday season. In 2011, it was reported that a third Prep & Landing holiday half hour special was in pre-production, but it was apparently abandoned when the sequel failed to match the expectations of the first short. To that decision, I say "Frostbite!" which is the curse word used by elves at the North Pole. For those unfamiliar with how this clever series first started, today's column takes a look at that interesting history and might encourage some of you to let Disney know you would very much like to see more adventures with Lanny and Wayne and friends. If nothing else, this background information might enhance the experience of re-watching the existing cartoons or attending the WDW event. Prep and Landing Poster features Wayne, Lanny, Magee and the GBM (Gingerbread Man). Landing on a flight deck of an aircraft carrier at sea is one of the most challenging things a Navy pilot can be asked to do. To land on the deck, each plane has a an extended hook attached to the plane's tail called a tailhook. The pilot has to maneuver his plane to snag the tailhook on one of four arresting wires, sturdy cables woven from high-tensile steel wire, across the deck. Landing Signals Officers (LSO) help guide the plane in, through radio communication as well as a collection of lights on the deck. If the plane is off course, the LSOs can use radio commands or illuminate other lights to wave the pilot off. The crew that does the preparation and landing procedures are vital for the success. Since Santa also pilots a flying vehicle and must make landings on multiple unusual surfaces, Disney storyman Chris Williams wondered if the jolly old elf also might have a flight crew to help him do so on Christmas Eve. Williams worked in the story department for Mulan (1998), The Emperor's New Groove (2000) and Brother Bear (2003). He went on to co-direct the feature Bolt (2008) and later Big Hero 6 (2014). "It's important to remember that Stevie [Wermers-Skelton] and I didn't actually come up with the premise for [Prep & Landing]," co-director/writer Kevin Deters told writer Jim Hill. "Chris Williams was the one who initially dreamed up the idea of this elite group of elves who each year help get houses ready for Santa's arrival. And when Chris got too busy directing Bolt to do Prep and Landing, (Chief Creative Officer of Disney Animation) John Lasseter turned to Stevie and I and asked if we'd be interested in developing Chris's idea." Deters joined Walt Disney Animation Studios in 1996, and worked in a variety of creative capacities on films like Mulan, Tarzan, Lilo & Stitch, Brother Bear, and Chicken Little before making his co-directing debut with the short How to Hook Up Your Home Theater (2007) about Goofy's difficulties in installing his new home theater system in the tradition of the classic Goofy "How To" series of shorts. Wermers-Skelton began her association with Walt Disney Animation Studios in 1994, starting as a clean-up artist/in-betweener on Grandmother Willow in Pocahontas and moving on to work as a story artist on Fantasia/2000, Tarzan, and Brother Bear. She became one of the Disney Studios' first female directors with her work co-directing the Goofy short, How to Hook Up Your Home Theater with Deters. Deters and Wermers-Skelton had worked together for years in Story Development before co-directing/co-writing the cartoon that was part of a program by Walt Disney Animation Studios to revive original seven minute shorts to precede Disney theatrical features. Williams had pitched the idea of Prep & Landing as another seven minute installment of that program. Not only did Lasseter like the idea, but he felt that instead of a short that it should be expanded to a half hour television Christmas special like the ones he remembered watching when he was younger. He supposedly marched into the office of president of ABC Entertainment division Stephen McPherson and pitched the idea of Walt Disney Animation Studios producing a brand-new holiday special for the network and McPherson readily agreed. "We had already begun working on our second short, The Ballad of Nessie (2011), when John (Lasseter) approached us with the idea of turning Prep and Landing into a holiday special," Wermers-Skelton said. "This is right before Christmas in 2007. So I got to spend the holidays thinking about how Kevin and I were going to do this new Christmas special." "Chris had already created the characters of Lanny, the excited rookie, and Wayne, the jaded veteran," Deters stated. "But that was just for the seven-minute-long short version of Prep &Landing. We were looking to tell a far bigger story with these characters. So we worked closely with John to expand our storyline, flesh out the world of the North Pole and these elves." Like Lasseter, Deters and Wermers-Skelton had grown up watching animated holiday specials on television and loved them and were excited about doing the project. "We collaborated with so many great people on this program. Andy Harkness and his art direction, Michael Giacchino and his score," Deters stated. "Not to mention the vocal cast, Dave Foley, Sarah Chalke and Derek Richardson. The show just got better every step of the way." Walter A. Fuller was an air traffic controller at Bob Hope Airport in Burbank, California. He was a neighbor of Susie Coffer, who worked in Development at WDAS, so she was able to arrange for Deters and Wermer-Skelton to meet with him at the Burbank air traffic control tower in spring 2008. They were looking for insights and terminology that they could incorporate into the scenes featuring the character Magee who performs a similar function. Magee (voiced by Sarah Chalke) has been the North Pole Christmas Eve Command Center Coordinator for almost 200 years. She was picked personally for the job by Santa and it was a role once held by Magee's own mother. Fuller gave them a tour and continued to communicate with them supplying information for the next five months until he died in the Chatsworth Metrolink crash, the largest commuter rail disaster in California's history. Twenty-five people were killed and a 135 injured. To honor his memory and generosity, an elf who looked like him was included in the North Pole Tower and the final film included the credit line: "In Loving Memory of Walter A. Fuller". 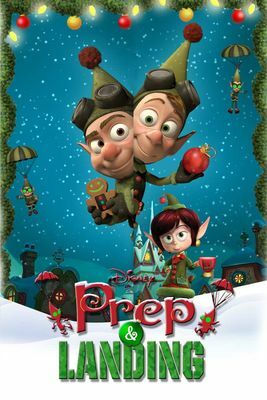 The stories revolve primarily around two elves of Santa's elite Prep & Landing unit: Wayne (voiced by Dave Foley) who has worked with the unit for more than 227 years, longer than almost all other elves currently active in the division, and his over-eager young partner Lanny (voiced by Derek Richardson) who is an inexperienced rookie. Lanny received his training and graduated at the top of his class at Kringle Academy achieving record marks in Holiday History and Christmas Cheer. Wayne's call sign is "Little Drummer Boy"; Lanny's call sign is "Tree Skirt." The two are equipped with top-of-the-line technology and the thought that went into creating this specialized equipment is just one example of the richness of the world that was created. A scanner to determine if any creatures are stirring. Access to the North Pole naughty and nice list database listing a profile and recent behavior of children in the assinged home. A cookie assessment scanner to determine the type and ingredients of cookies left out for Santa Claus. Santa does not care for nuts in his cookies. A holographic projector that projects a scale representation of a gift under the Christmas tree to determine if there is enough clearance under the branches. If not, branches can be trimmed with the snowflake buzzsaw contained within a pouch on the wrist. When activated, the snowflake telescopes out before whirring to life in saw mode to trim unnecessary branches. A sync function that allows a GBM to be remotely controlled by a partner's GBM. A flashlight with strobe and multi-color capability. A music player that now also plays videos. The grappling hook is shaped and painted like a striped candy cane. Once the hidden stud on the side of the cane is depressed and held, the hook end splits open into a three-pronged grappling hook. Sliding the activation stud downward fires the hook and the attached zip line outward at rapid speed. The line continues to fire up to 30 feet, as long as the activation button is held down. The line can be quickly retracted by depressing the stud a second time. The feature allows the elf to zip easily up a chimney. The Sparkle Blaster is similar to a hand grenade. In its concentrated form, sparkle can send any creature that is still stirring into a deep sleep, which usually last an hour. The sparkle is contained within what appears to be a Christmas globe ornament, complete with hook. When the hook is twisted and removed, however, the sparkle within is activated. Within three seconds of activating it, the sparkle begins to immediately dissolve the exterior of the ornament. A properly timed throw will strike its target at the exact moment the shell completely dissolves, allowing the sparkle to hit with maximum effect. The unassuming snowman figure is used like the cables on an aircraft carrier. Upon depression of its top hat, the snowman springs forward, breaking into three sections tethered by taut tubing. Each section is weighted so once it lands in place on a rooftop, it is nearly immovable until deactivated. The hat brim on the hat section slides up and opens into a radar dish to signal Santa's sleigh. Once the dish powers on, the snowman sections and transparent tubing strobe with landing light patterns, creating a landing strip for the sleigh. Additionally, the inside hands of the two elves' snowmen shoot forward, connecting magnetically together to form a tow cable line across the landing strip to catch the tailhook on the bottom of Santa's sleigh. The cable is deceptively strong with a tensile strength capable of supporting the weight of a fully loaded semi trailer. "We wanted this story to be timeless while – at the same time – reflect a contemporary Christmas," Deters remarked about trying to balance a sense of nostalgia with modern technology. The special aired on ABC December 8, 2009, and was not only the highest-rated Christmas television special of the year, but received critical acclaim. The industry trade newspaper Variety called it "clever and colorful…considerably smarter than the average kids special." As a result, a sequel Prep & Landing: Naughty vs. Nice was greenlit, as well as a short to help fill the gap before its premiere and keep the franchise prominent in an audience's minds, Prep & Landing: Operation: Secret Santa. Lasseter said, "We had so much fun making the first Prep & Landing special, and the response from the audience and our colleagues in the industry was so terrific, that we wanted to bring these great characters back for more holiday fun. "Kevin and Stevie have done an amazing job writing and directing these films, and everyone at Walt Disney Animation Studios has pitched in to make them truly extraordinary entertainment. We know they will become holiday favorites." Detailed official biographies for the characters, descriptions of locations and technology as well as how this world operates was created and posted on the Disney website when the films were first released. For the DVD/BluRay release, the extras included three training films for Kringle Academy (that trains Prep & Landing elves) done as a parody of the old 1950s training films, including scratches on the film and opening number countdown. Also included were two vintage black-and-white newsreels of the North Pole News and several short color commercials for local establishments like the Fruitcake Factory and Christmas Carol's. All of these extras were done in Flash animation. The premise for the sequel was based on a long-standing holiday tradition: the family squabbles that often result from physically reuniting with siblings for the celebration. "So many people — when they go home for the holidays — suddenly find themselves dealing with old family tensions and sibling rivalry," Deters explained to writer Jim Hill. "Which is why we thought it might be fun to explore this story idea within the Prep & Landing universe by giving Wayne the Christmas Elf a younger brother who's kind of a celebrity at the North Pole." "Of course, what was fun about making Noel a Coal Elf is that — while we did get a brief glimpse of these guys during the first Prep & Landing — Naughty vs. Nice now gives us a valid excuse to explore this whole other side of Santa's operation," Wermers-Skelton said. "So we use the North Pole's B.U.L.B. transit system — which is just like Disneyland's old Skyway, only the ride vehicles are Christmas bulb-shaped — to take Wayne & Lanny over to the Coal Elf District. And we then send these characters into Christmas Carol's, which is this great bar where all of the Coal Elves go to hang out after work." "Since we're telling this story from the elves' point-of-view, Santa Claus really is The Big Guy. Which is why we wanted this character to come across as being large, powerful and somewhat mysterious," Deters explained about why there is never a full view of Santa's face," he said. "That was a deliberate choice on our part. That's also why we went with veteran character actor W. Morgan Sheppard as the voice of The Big Guy. He brought sort of a gruffness to this role. Which is why you easily understand why Wayne would be kind of afraid when he dropped by Santa's office on Christmas Day." A printed adaptation of the original special was published by Disney Press in 2009, and plush toys, pins and ornaments have been made available at Disney Stores during the Christmas season. In 2011, Hallmark had a line of Prep & Landing-related toys and ornaments. Elves Wayne and Lanny make a brief cameo appearance in Olaf's Frozen Adventure (2017) also co-written and co-directed by Deters and Wermers-Skelton. As Olaf stands in front of a fireplace watching four kids in nightgowns hang up their Christmas stockings, to the far right side of the mantle are carved wooden figures of the two characters right next to a Yule Goat (a Scandinavian tradition). "I'd love to see Wayne and Lanny become so popular that they'd then be turned into walk-around characters at the Disney Parks," Wermers-Skelton said. For those who love stories about Disney and Christmas, two things that just seem to go together, my latest book has just been released: Vault of Walt: Volume 7: Christmas Edition, which is filled with nothing but yuletide tales of Walt Disney, the Disney theme parks, Disney animation and comic books and more. Next Week: The Complete Filmography (including the Marvel comic book story where Wayne and Lanny have to prep the Avengers Mansion) of Prep & Landing.